Cycladic Island number three for this trip through Greece is Ios. 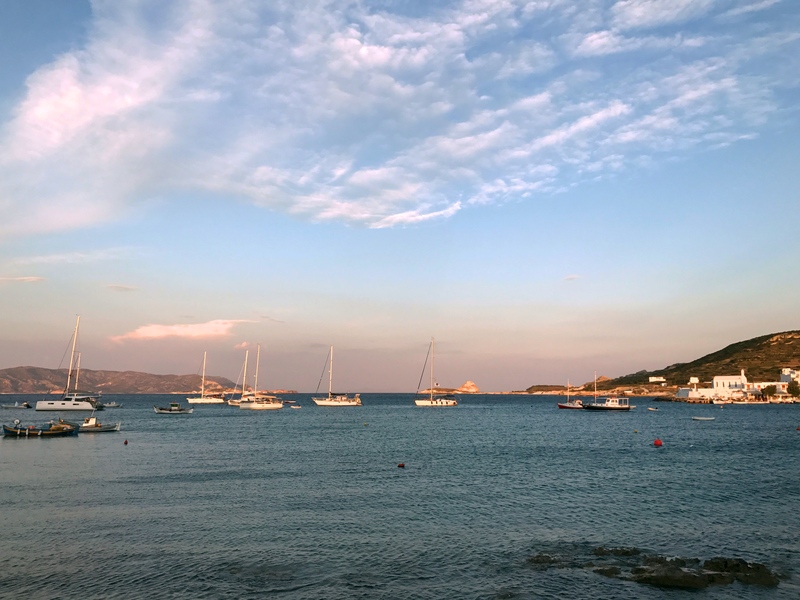 One of the joys for us has been the ease of traveling island-to-island on the Greek ferries. There is an almost astounding number of boats that ply the Aegean Sea moving people and vehicles and goods from one island to another. There seems to be a variety of companies and speeds and routes and types of boats, but in all it makes it easy, comfortable, and even fun to move along. 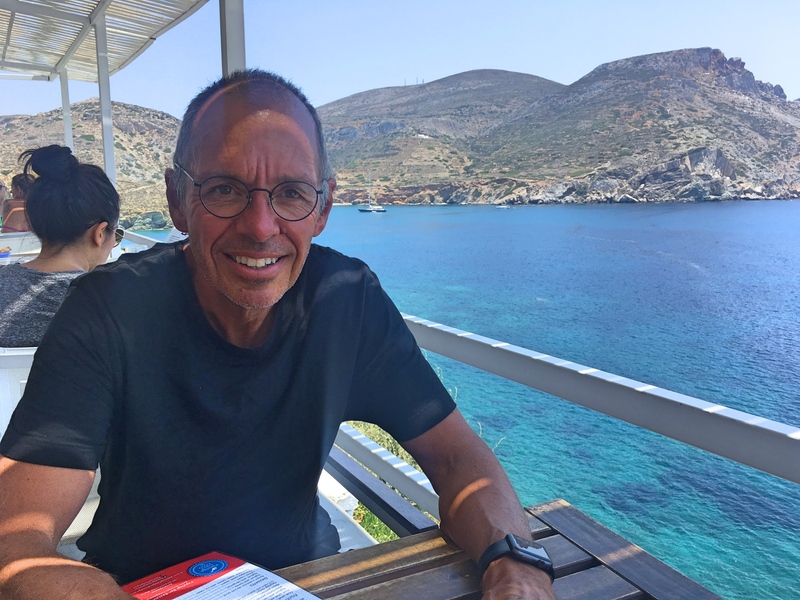 We weren’t too happy with our hotel on Folegandros; we didn’t like the location and the service just seemed to miss the mark. Here in Ios, though, we found the sweet spot. 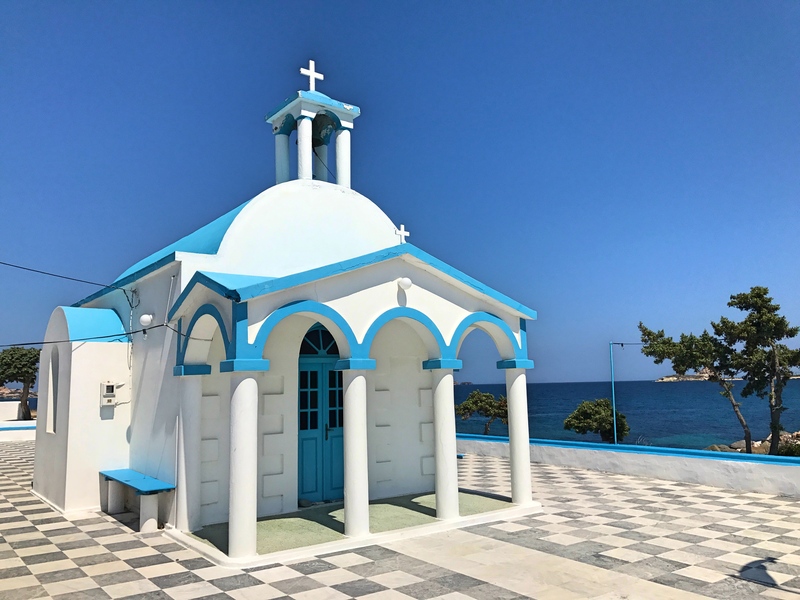 The two major settlements on the island are around the port and then up the hill in Chora, which is what all the main island villages seem to be called. Our hotel was maybe two-thirds of the way up the hill so we had reasonable access to both the port and the village. And the hotel itself was beautiful; there was a beautiful pool overlooking the sea and we had a great little balcony for watching the sunset. 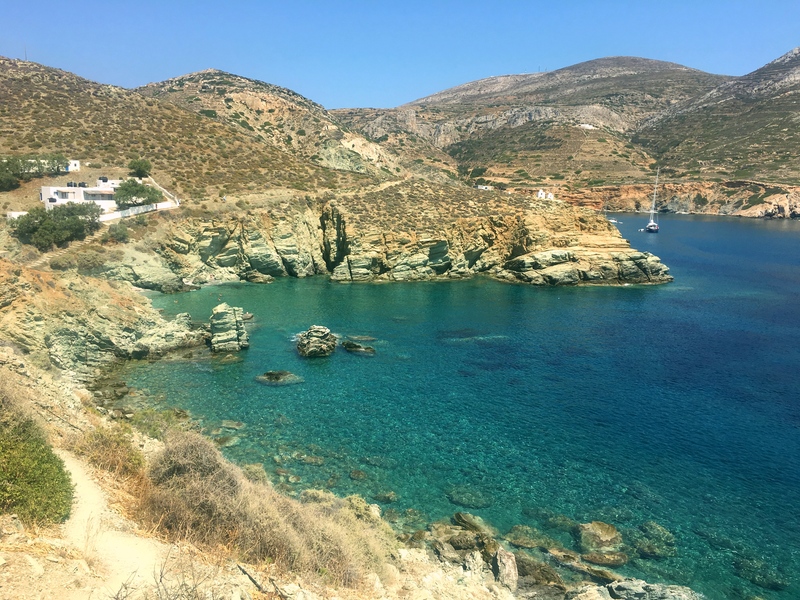 Compared to Folegandros and Milos, our first two stops, Ios is much more of a party town than anything we’ve seen before. On our first day I was walking up into the village and saw a sign on a club that indicated it opens – opens – at 3:00 AM. And entrance is free if you get there that early; the cover charge only starts at 3:30 AM. Even when I was young that would have seemed crazy. Who goes out to start the night at 3:00 AM? But sure enough, when I would go out for a morning run at 6:30 or 7:00 I would see kids apparently headed home after a night (morning) of partying. Strange. Doors Open at 3:00 AM the sign says. 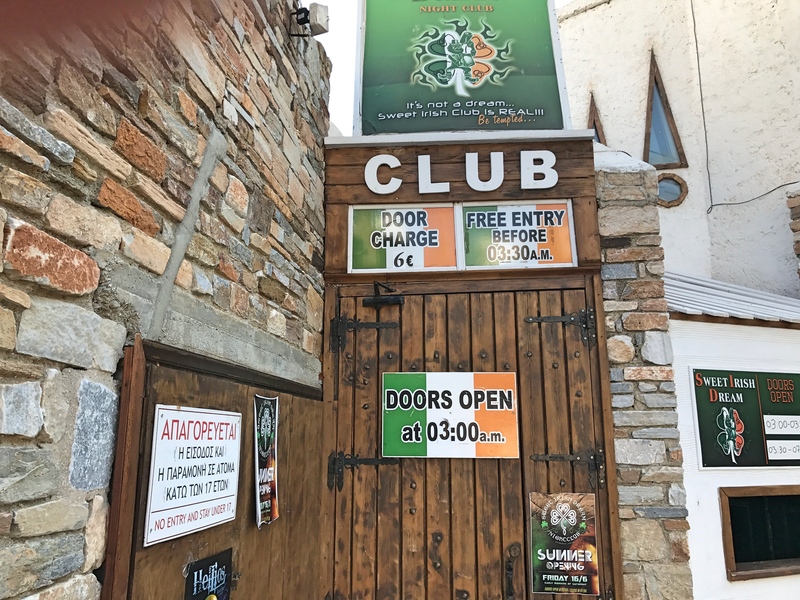 And it wasn’t the only club in Ios with those hours! The village itself was beautiful, all narrow, winding streets with whitewashed buildings. Lots and lots of bars, and some good restaurants. Like all these islands Ios has some interesting history, though in this case the line between history and myth is vague. 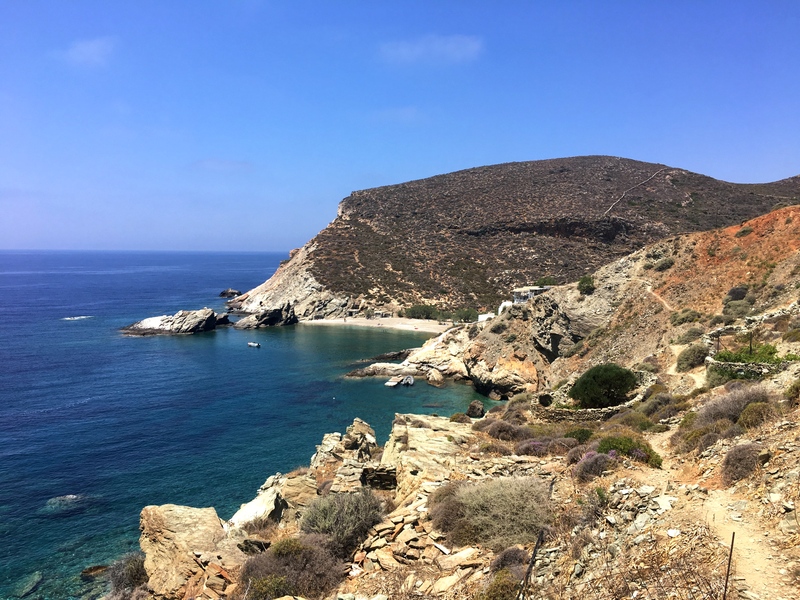 It is here, you see, that the great classic Greek poet Homer – the blind author of the Iliad and the Odyssey – is said to be buried, and you can go to the northern part of the island to see his grave. The only problem is that historians are not at all certain that a Homer ever actually lived. This school of historians think that these works were really the results of countless and nameless tinkerers in an oral tradition and that “Homer” should be seen as simply a label given to that tradition. So if he did live, his grave is here. If he didn’t live it’s just a pile of rocks. For us the real delight in Ios was discovering Mylopatas Beach. I was just kind of randomly out for a walk late one morning after a haircut and followed the road out along the coast. The road was quite a ways up a hill when suddenly I came around a corner and saw what looked like an amazing beach below. So down I go and … Wow! Mark & I proceeded to spend the better part of two days there. 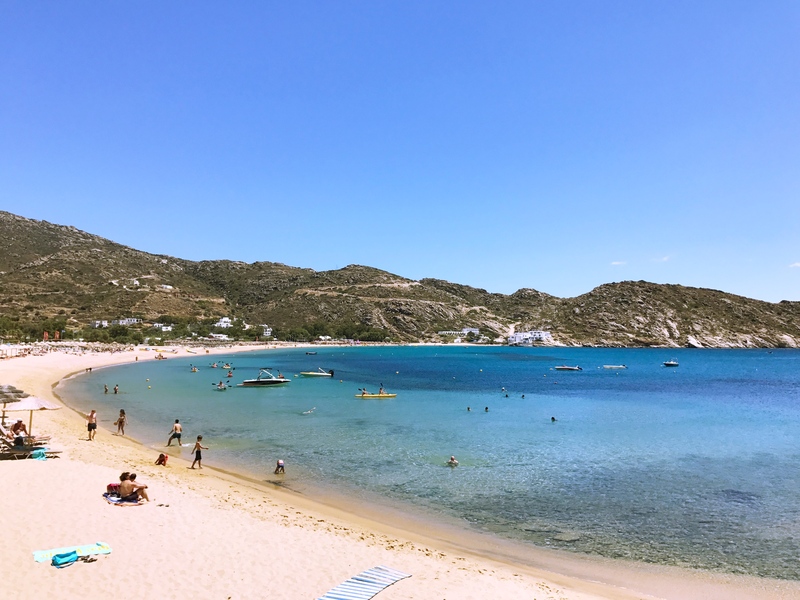 Spectacular water, nice sand, really comfortable beach beds, great rocks to lie on if that was your preference (and it was mine for a while), and even a nice Greek taverna perched just slightly up the hill where you could have good food with great views. We really thought it was one of the great beaches we’ve ever seen, on a par with our all-time favorites in Thailand and Sardinia. The only downside, and we’ve seen it in a variety of places, is that businesses on the beach have come to believe that a great beach experience requires loud, pounding club music all day. It’s a mystery to me why they think that is preferable to the gentle washing ashore of waves, but then maybe I’m just getting old. OK, I am getting old, but still, I’m not the only one. It’s a tough life we have. You can see the stress I’m experiencing there. Next stop Mykonos where my brother Al and his wife Anita are joining us for the last half of our Greek adventure. 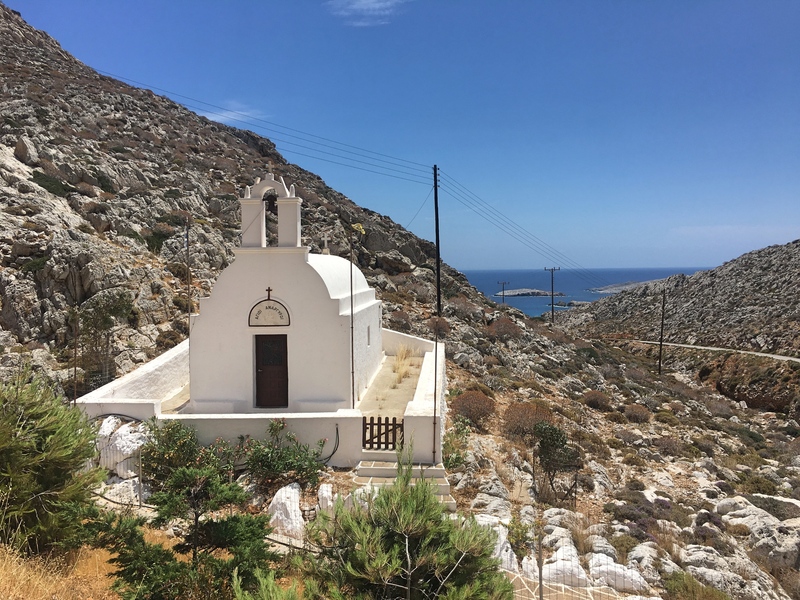 Stop two on our Cycladic Island extravaganza was the small, quiet island of Folegandros. 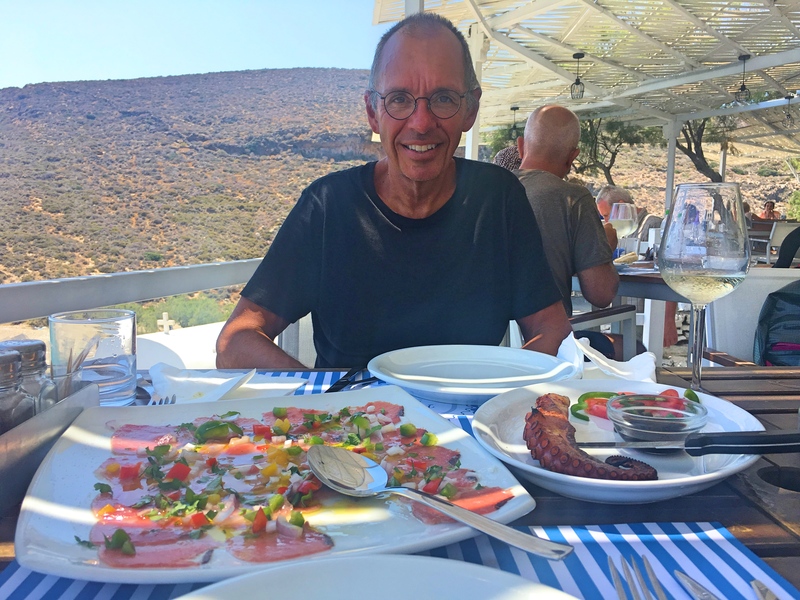 Mark says Folegandros has been on his radar for several years but I’m pretty sure I first heard of it when someone – I think it was the New York Times – put it on a list of “little-known places you have to go to.” And since it’s a fairly short boat ride from Milos we slotted it in for four days. 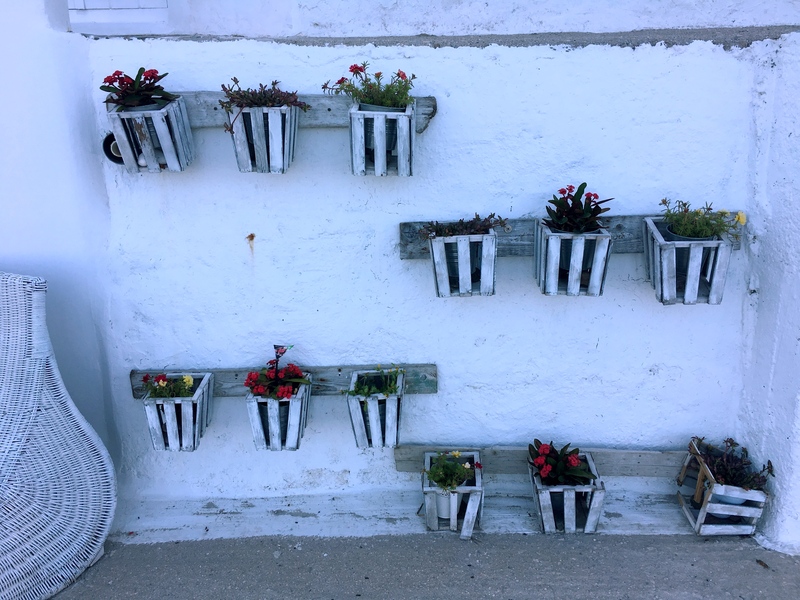 We loved Folegandros. As I said, it’s a small, quiet place, just over 12 square miles and less than a thousand permanent residents. 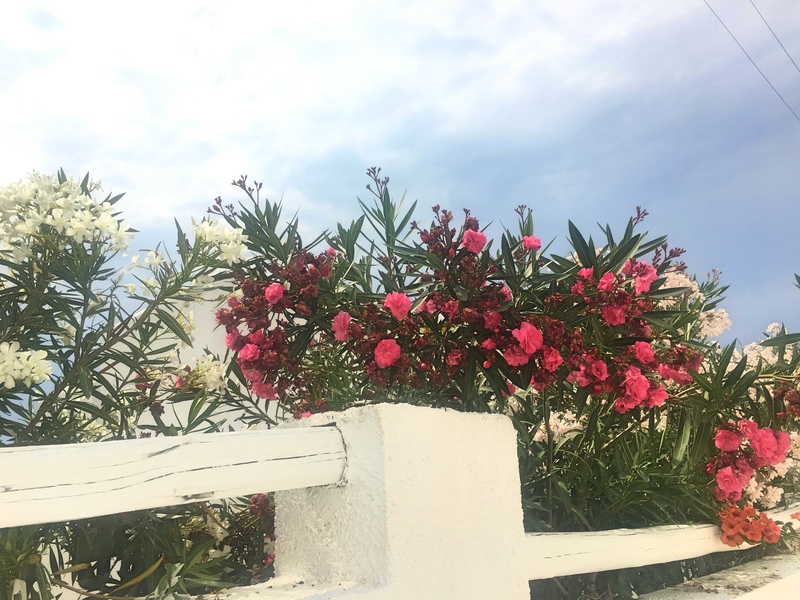 The island has a small village around the port, Karavostasis, and then the main town of Chora about a mile-and-a-half up (and up and up and up) the island. 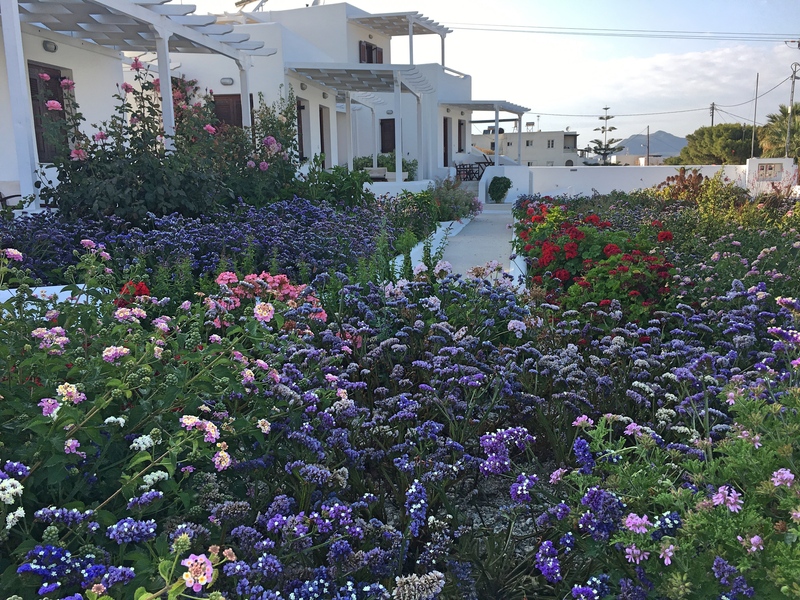 We stayed in a nice hotel in Karavostasis which was a bit of a mistake as most of the interesting stuff was up in Chora, or beyond that. We picked Karavostasis, despite its relative isolation, because we thought we’d like the hotel (the Anemi) but it wasn’t all it was cracked up to be. So that part wasn’t ideal. Oh, before I forget there were two cool stories from the hotel. When we arrived at the port someone from the hotel was there to pick us up; there was a non-trivial hill to get to the hotel so it made sense. A couple other people from the boat were staying there, too, so we all got in. When we got out I immediately noticed that one of the guys – from New York City, naturally – was wearing a pair of Common Project sneakers. I’d never heard of them until recently but the $400 shoes are very big among a bunch of celebrities and – this is the cool part – were designed by the son of a great friend of Mark’s parents. Small world. The other cool story from the hotel was the night we decided to have a light dinner at the hotel bar. We were chatting with a young woman who’d been on some women’s pilgrimage and we talked a bit about politics. Shocking, I know. After a while Kevin and Laura at the far end of the bar joined in because they like to talk about politics, too. They live in Georgia, in the congressional district that is having the highly contested special election. Laura had never before been involved in a campaign but she is so offended by Donald Trump that she is now her precinct captain, using the VAN every day (when she’s not on vacation, and actually even some when she is on vacation) to drive volunteers and contact voters. She practically shrieked when she learned that Mark had invented the VAN and proudly showed us the MiniVAN on her iPhone. We had a great time talking late into the night. Enough stories from the hotel. 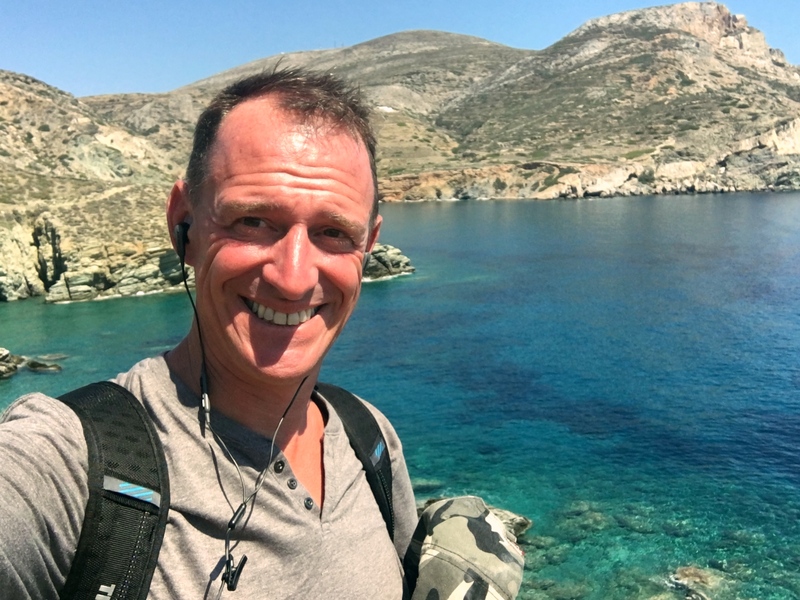 The big deal was that Folegandros was a great island for walking, eating, and going to the beach. 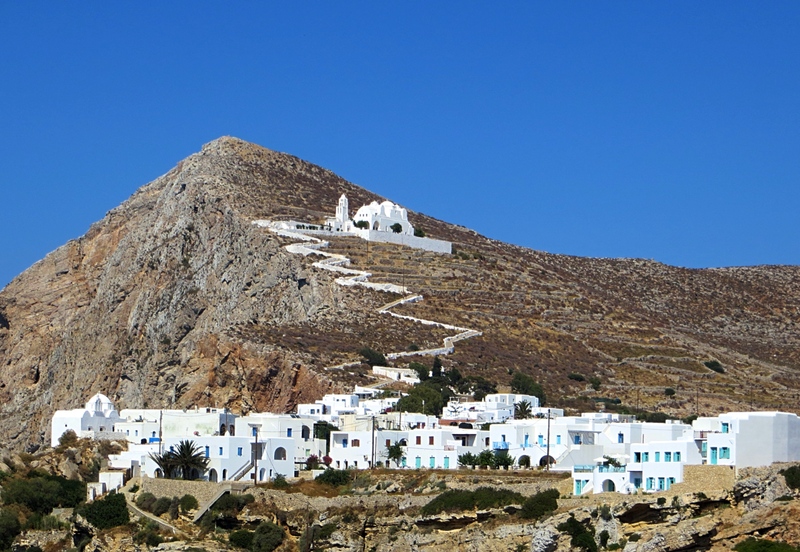 When we first got to Chora, the main town on the island, we discovered that it sits on the edge of a 600-foot cliff which makes for pretty spectacular views. Then there were a couple very cute little squares with extra cute little cafés and Greek tavernas for lunch. All just very charming and relaxing. 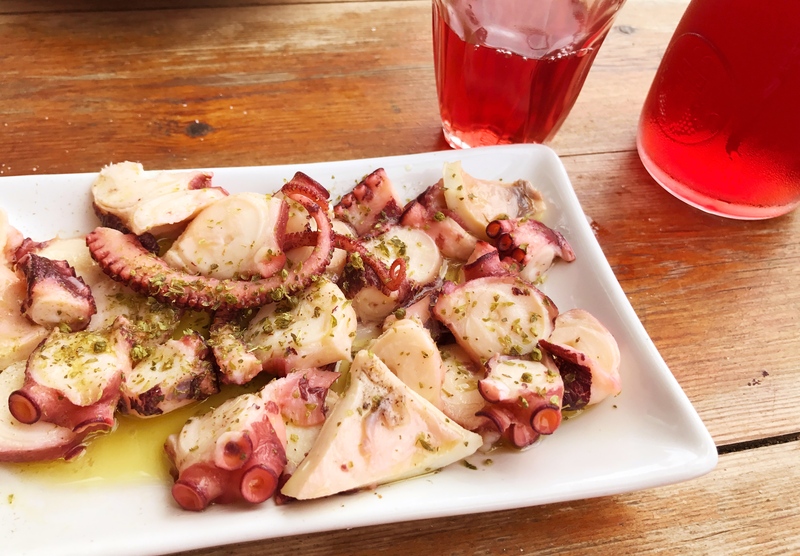 Then we discovered Agkali Beach and Papalagi Seafood Restaurant. We’d rented an ATV for a couple days to get around (very unlike us, but it was better than having a car and we needed something) and Kevin & Laura told us we had to go there. So we did. From Agkali you actually walk maybe 15 minutes along a winding path to another beach, above which sits Papalagi. We were in heaven! The beach itself wasn’t actually great; no beach chairs or umbrellas and really more small pebbles than sand. But it was sufficiently isolated that there weren’t too many people and the water was just spectacular. 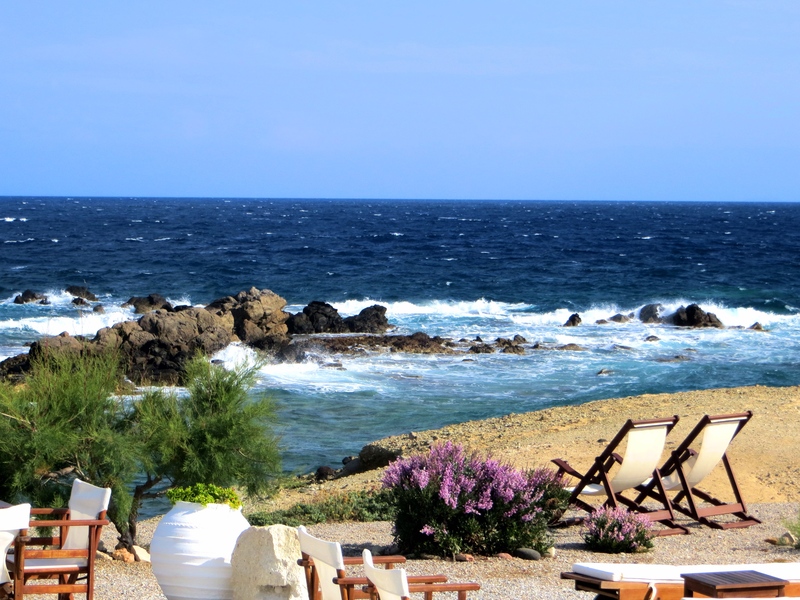 And then the highlight was the restaurant, perched high above the beach with great food, cold wine, and stunning views. That is a life worth living. 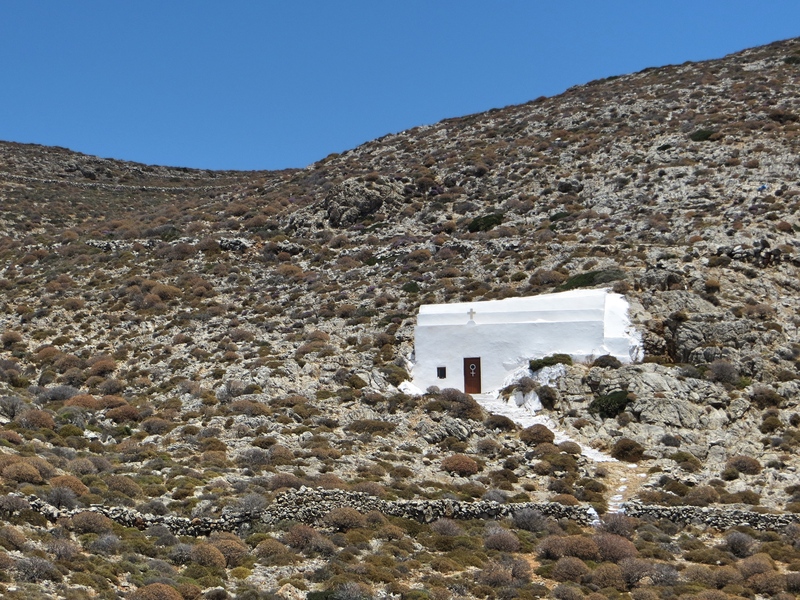 So Folegandros was a big success. Next time we would almost certainly stay in Chora so we weren’t constantly going up and down the long hill to get to good restaurants, but except for that little mistake on our part it was a nearly perfect stop. Next up, Ios, which our Mac wants to auto-correct to iOS, Apple’s operating system for their iPhones and iPads. But just to be clear, Ios predates iOS. And another on the same stretch. Oddly, a Greek woman Mark chatted with on the boat tour in Milos told us that we would love Folegandros because it was so green. 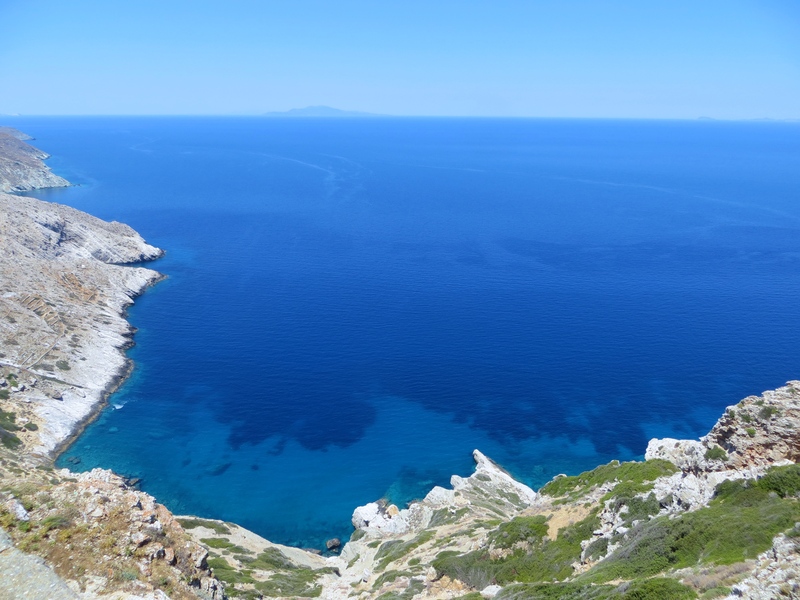 Maybe there’s another island named Folegandros, but it sure wasn’t green. 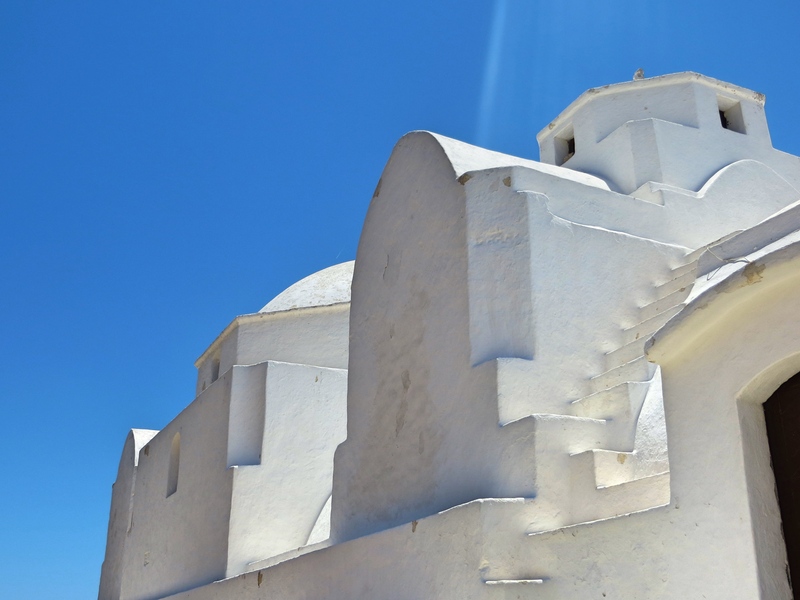 The town of Chora with another church looming far above. And yes, I waked up there. Mark taking a selfie as he walks back from our favorite beach. The walk with those views was almost as much fun as the beach itself. 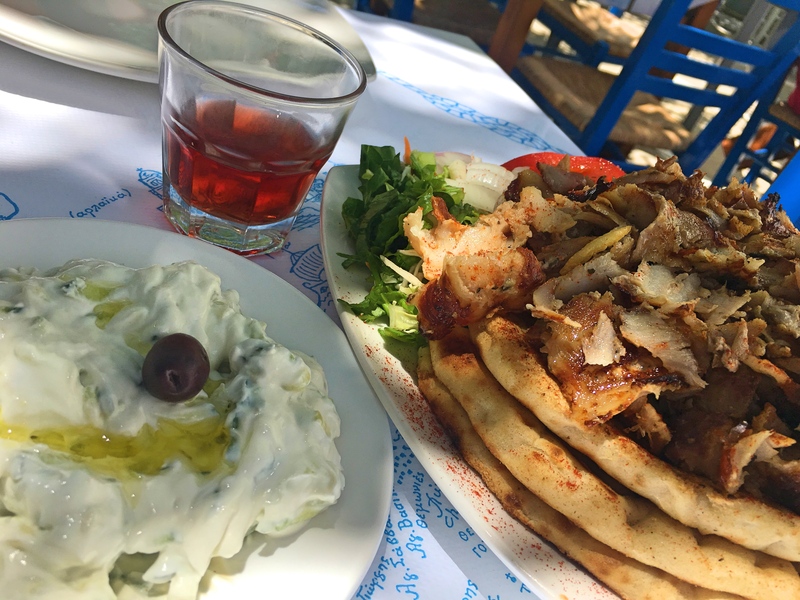 Lunch in Chora: tzaziki, a glass of wine, and some sliced pork. Yum! 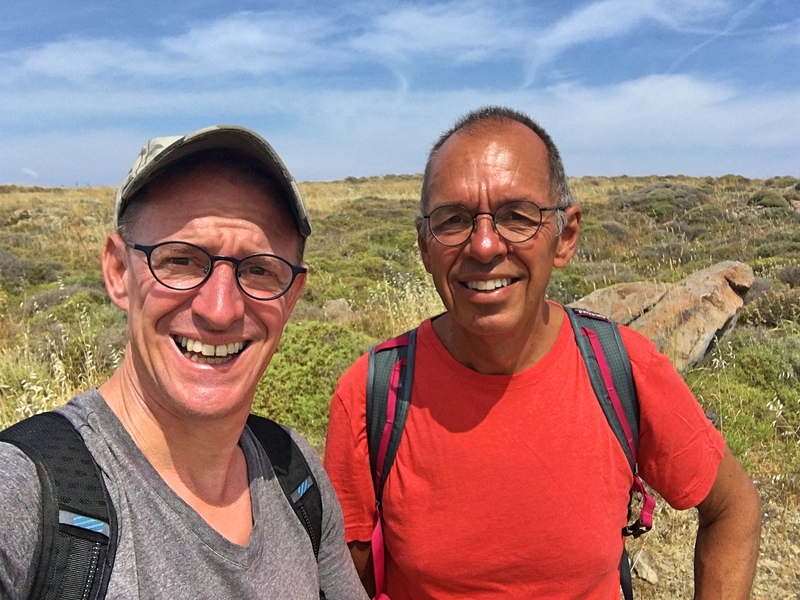 Here we are in the Cyclades, back again two years after our last visit. 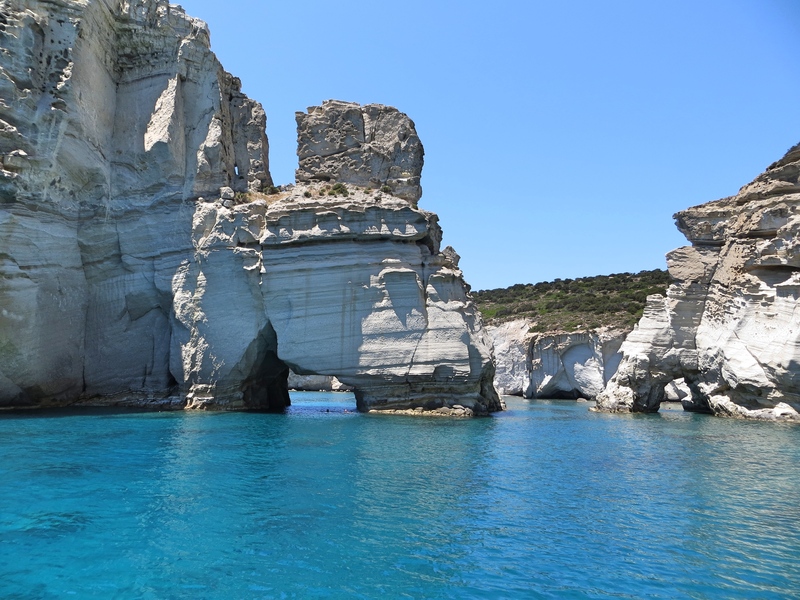 The Cyclades consist of about 20 major islands in the Aegean Sea southeast of mainland Greece. 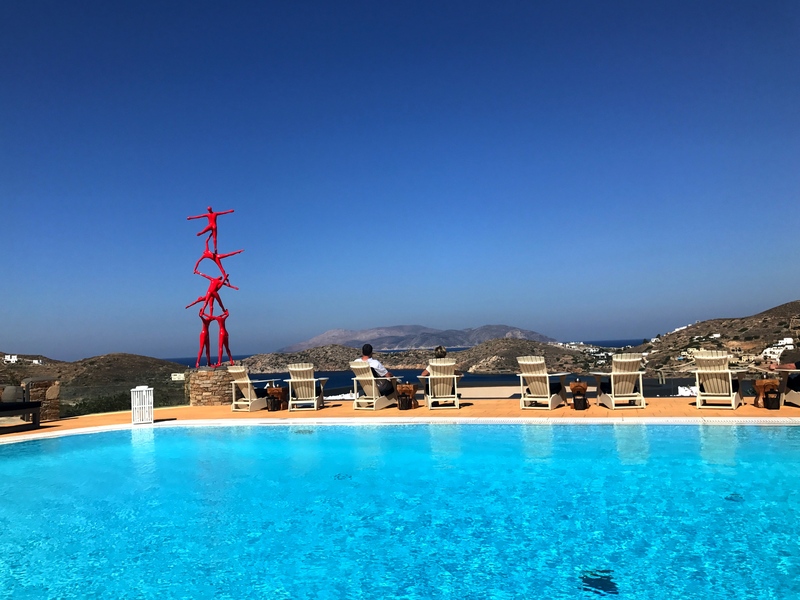 While today the most famous Cycladic islands are Santorini and Mykonos, the sacred island of Delos – birthplace of the twin gods Apollo and Artemis – was historically the most important of the islands. 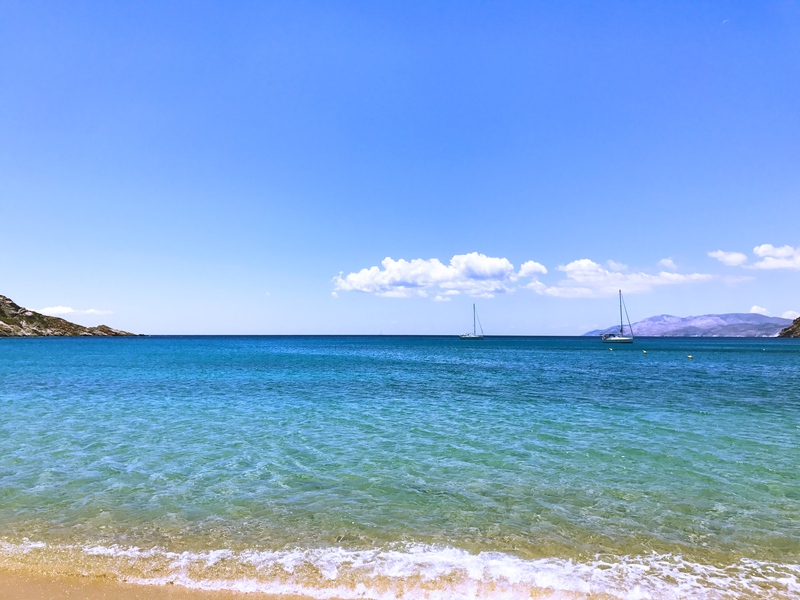 In fact the name of the island group derives from the fact that collectively they form a circle (Cyclades can be translated as “circular islands) around Delos. 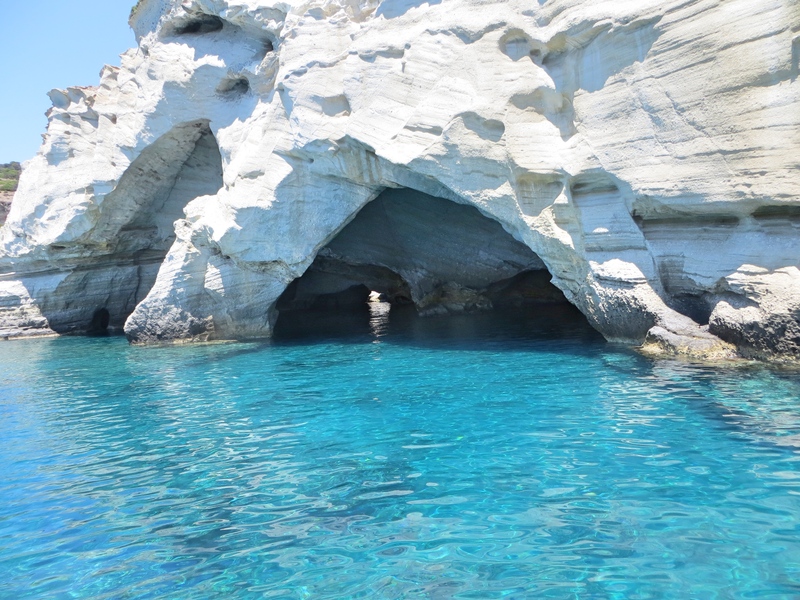 As for Milos, it sits on the southeastern corner of the Cyclades. 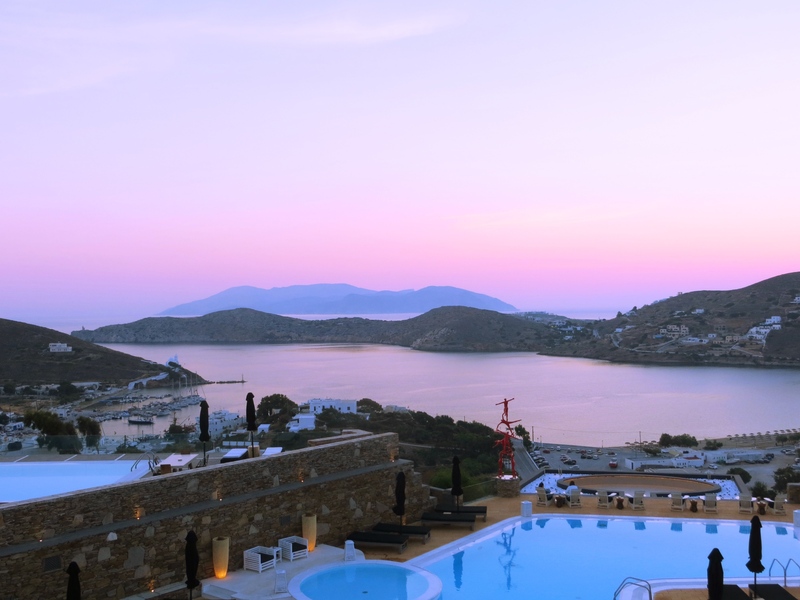 Now you may think you’ve never heard of Milos but you have. Think “Venus de Milo.” Yup, Venus of Milos, perhaps the greatest – certainly the most famous – work of art from the ancient era was discovered on Milos. Dating from around 100 BC and depicting the Greek goddess of love Aphrodite (the Romans called her Venus, so today she’s kind of misnamed), it was discovered by a local peasant just out poking around some ancient ruins in 1820. He ended up selling it to the French ambassador for a pittance and thus today resides in the Louvre. 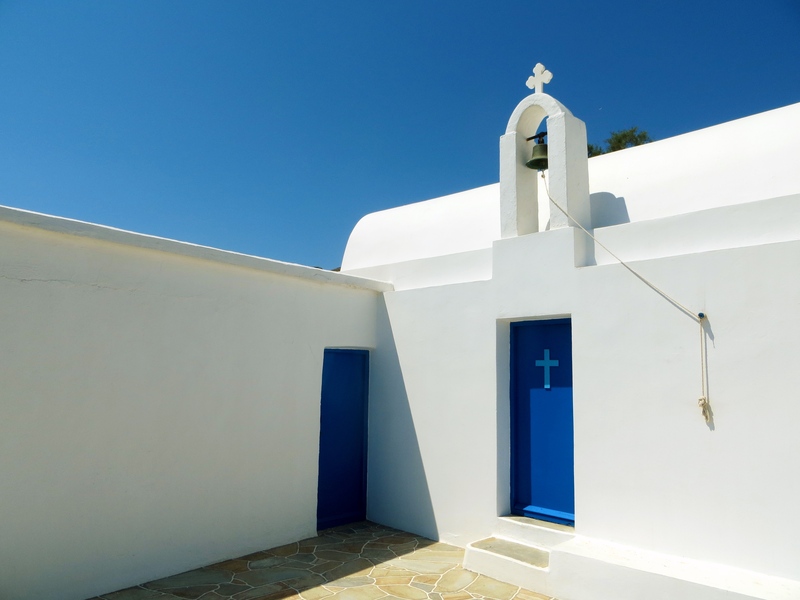 Greek churches are among the most picturesque buildings on earth. Like Japanese cherry blossoms from a couple months ago, you’re likely going to see a lot of them over the next couple of weeks. Back to the current era. 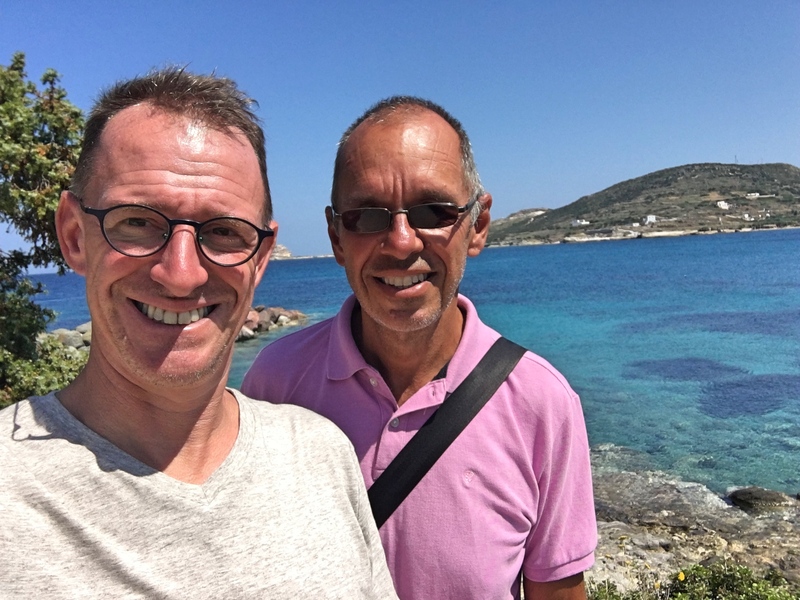 Mark and I really loved our last visit to Greece and to some extent were concerned that this trip couldn’t possibly live up to how much we loved Rhodes in particular. Perhaps we shouldn’t have worried; Milos was fantastic. Part of that was our hotel. We stayed at Tania, a little boutique place on the northeastern tip of the island run, presumably not coincidentally, by a woman named Tania. It has some of the best TripAdvisor reviews we’ve ever seen and for good cause. 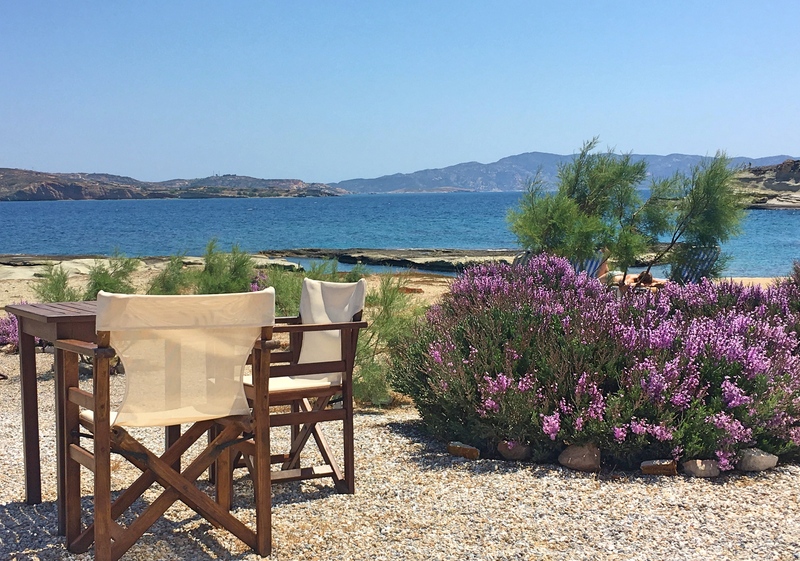 The location was really something – perched out on the edge of the island with incredible views and just a 10-minute walk from the delightful little town of Pollonia. 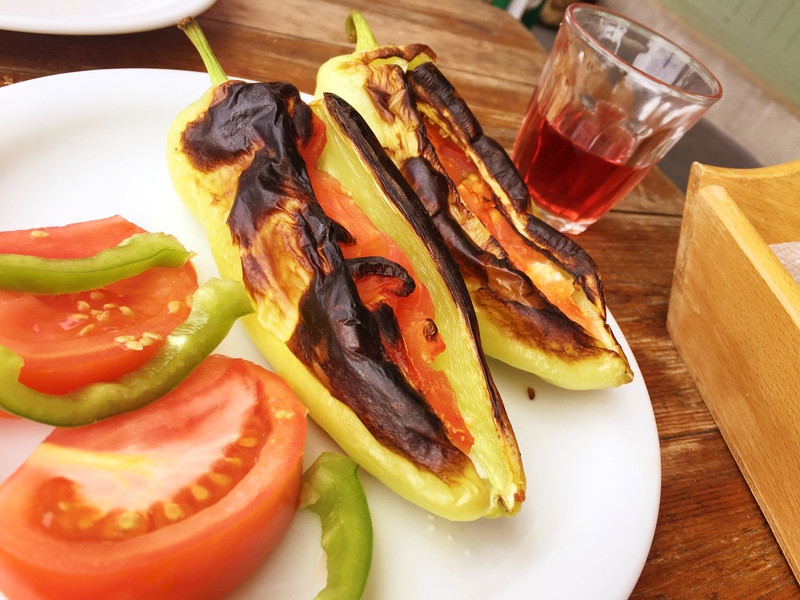 Tania’s mother Mary would make these delightful breakfasts – Mark insisted that a chocolate cake she would make was the single best thing he’d ever eaten in your life – and then you could sit for hours in the chairs facing the sea and read and sleep and tan. Until it was time to go into town for lunch where we found some really wonderful restaurants along the waterfront. But we did more than just eat and rest. One day we took an all-day (and I mean all-day, as in nine hours long) boat trip around the island so we could see and swim in some of the more remote part of the island. While a bit too long for our taste it was a great way to see the island and the 20-or-so other people on the boat were a lot of fun. Sometimes on a tour like that you can find too many boring people but this was a fun crowd. Except for the guy from Massachusetts who was a Trump voter, but I didn’t talk to him for very long after I learned that little tidbit. This was the kind of place that you couldn’t get to except on a boat, but where we could stop for a swim. In fact if you look really closely you can see people swimming through that opening on the left. 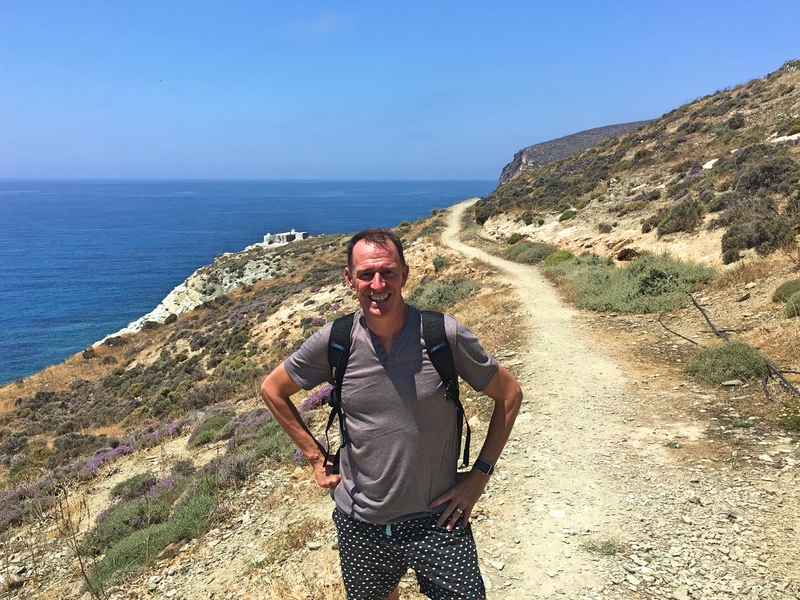 Another day we took a hike, a 12-kilometer loop from Pollonia and back. Part of the hike was nice but oddly much of the route was around and essentially through some big strip mines (bentonite, if you’re wondering). Now, spending part of my youth around the iron ore mining on the Iron Range I don’t find strip mines that interesting. And we really didn’t like the constant stream of huge trucks whizzing past us for much of the hike. Except for that, though, it was fine if not particularly noteworthy. 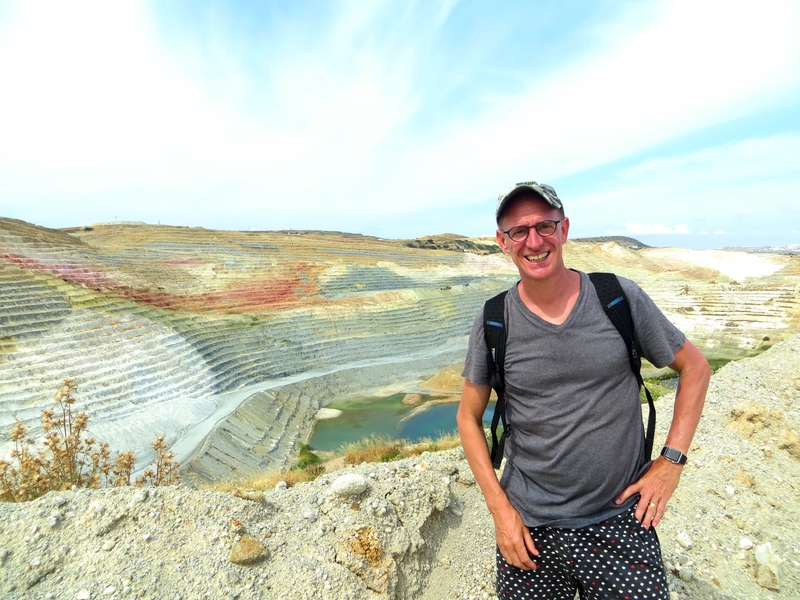 This open pit mine was colorful. If you could avoid the huge trucks for a few minutes the walk was OK.
Bottom line? Great hotel, really good restaurants, beautiful scenery, fun boat trip. 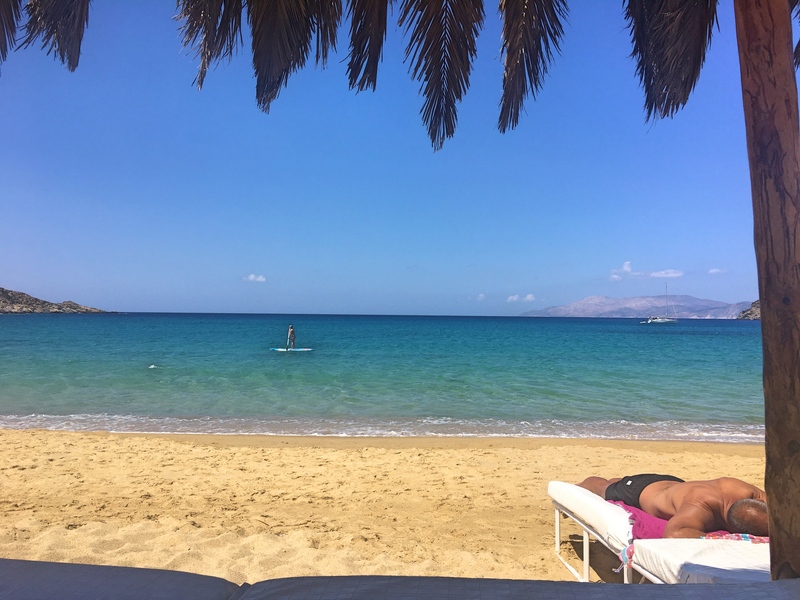 Our plan is to go to four more Cycladic islands, but so far we’re off to a damned fine start. Another cave from our boat trip. This one we swam through to a delightfully isolated cove on the other side. An abandoned sulfur mining area we passed on our boat trip. 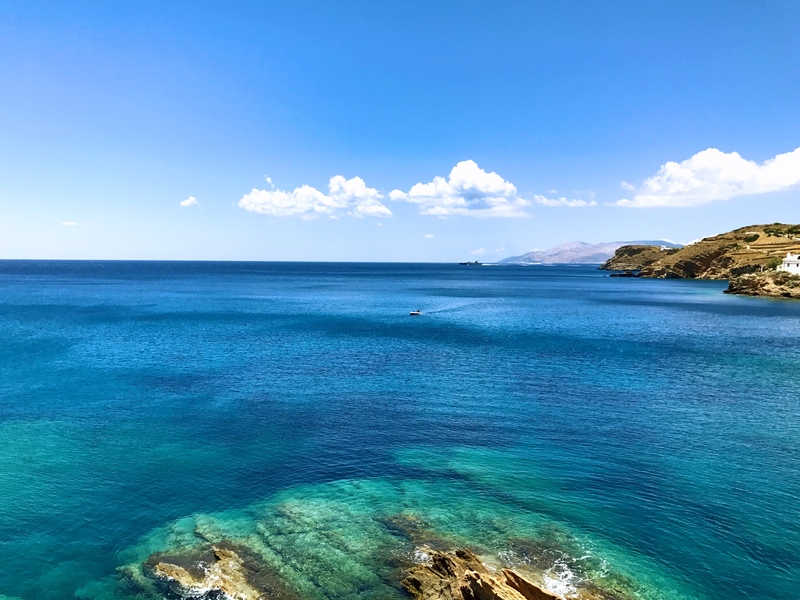 Sulfur used to big thing on Milos; the Roman historian Pliny the Elder noted in the first century AD that Milos was the most abundant source of sulfur in the ancient world. 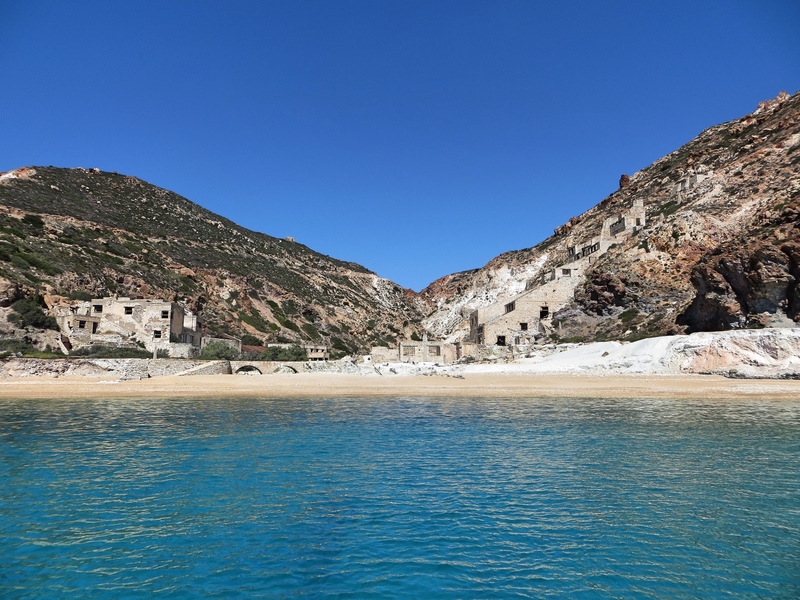 They’re not mining it anymore, but to this day you can’t swim on that beach unless you want to smell like rotten eggs for a few days. 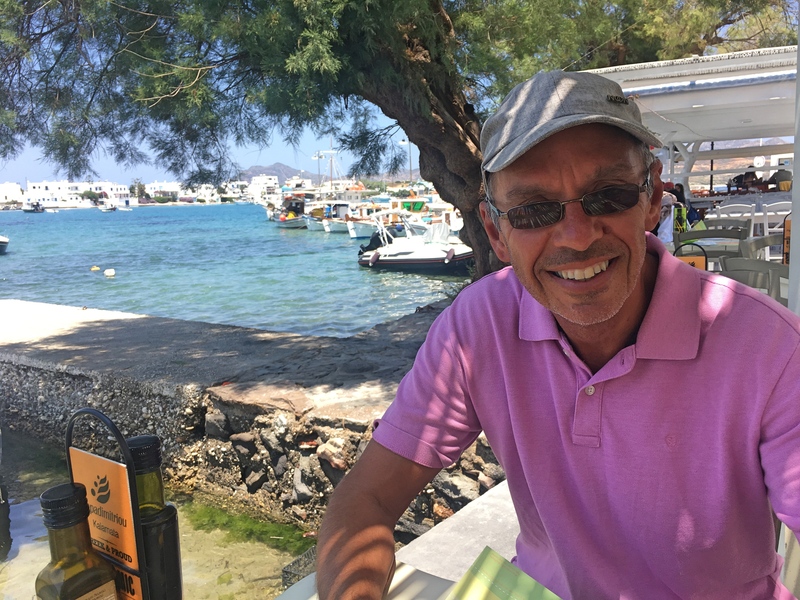 In the evening we would stop at Opsidianos on the way to dinner for just a little drink. You sat on couches, sipped a little Scotch maybe, and enjoyed views like this.